Mike Lyons ’88S (MBA) will never forget January 3, 1993. The lifelong Buffalo Bills fan sat slumped in the stands of what was then Rich Stadium, his spirits dashed as halftime descended on his beloved team, already down by 25 points in a mild-weather matchup against the Houston Oilers. Friends were packing up their seat cushions and coolers, sparing themselves the slow torture of a certain loss and bemoaning a sorry end to the regular season. They indulged in a little lighthearted heckling of Lyons and his cockeyed refusal to throw in the rowdy rag. Such stalwart support has had its rewards. Staying in his seat that day, Lyons watched as the Bills staged a history-making comeback—still the biggest single-game turnaround for a team in the NFL. But for the past 15 seasons, the team has failed to make a playoff appearance, and Lyons hopes to be in on the start of a bigger turnaround. 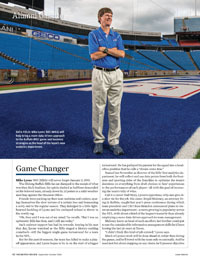 He has parlayed his passion for the squad into a head-office position that he calls a “dream come true.” Named last November as director of the Bills’ first analytics department, he will collect and use data points from both the business and sporting sides of the franchise to optimize the team’s decisions on everything from draft choices to fans’ experiences to the performances of each player—all with the goal of increasing the team’s tally of wins. Call it a career Hail Mary, Lyons’s opportune, why-not-give-it-a-shot vie for the job. His sister, Brigid Maloney, an attorney living in Buffalo, caught last year’s press conference during which team president and CEO Russ Brandon announced plans to create an analytics department—a move growing in popularity across the NFL, with about a third of the league’s teams by then already employing a more data-driven approach to team management. Maloney knew, as head of such an effort, her brother could put to use the considerable information management skills he’d been honing the last 26 years at Xerox. “I didn’t think this kind of job existed,” Lyons says. Much of Lyons’s work will be done ahead of, rather than during the games, and he’ll travel with the team only occasionally. And he need not fret about stepping on any cleats; he’ll present objective analyses to the coaches, who will then make the delicate decisions about whether and how they’re applied on the field. Lyons, who earned a bachelor’s degree in molecular engineering at MIT before pursuing an MBA at Simon, hasn’t missed a Bills home game since 1989. And while the team last made the playoffs in 1999, he remains an undaunted optimist. Unlike that lonesome halftime two decades ago, these days he’s hearing the cheers of his friends and family, including his wife, Christine ’93 (MS), ’99S (MBA), daughter, Chelsea, and sons, Nate, Rochester freshman Zach, and Luke. “Their eyes lit up,” Lyons says, remembering the moment he told his boys what their dad would be doing for a living. 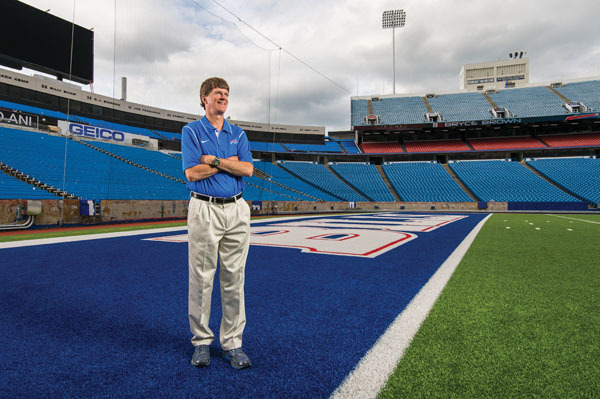 Squad system analyst Peter Linton, who makes up the other half of the team’s analytics department, says his new colleague’s kids have good reason to be proud: Lyons’s addition to the roster strikes a robust balance for the Bills of brains and brawn.